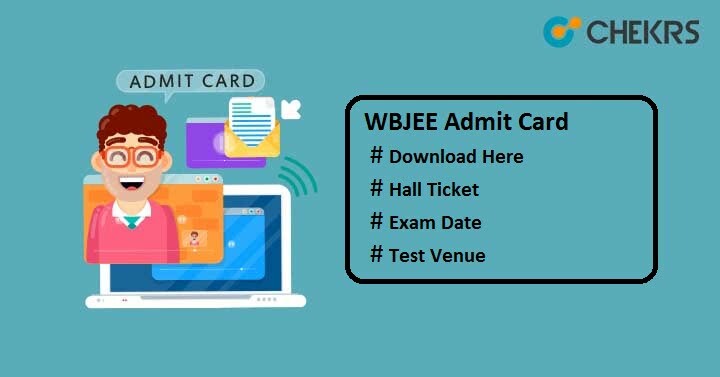 WBJEE Admit Card 2019: West Bengal Joint Entrance Exam Board (WBJEEB) will conduct the common entrance examination i.e. WBJEE-2019 for admission to undergraduate programmes in Engineering & Technology, Agriculture and Pharmacy. Candidates who will successfully submit the application form before the deadline will be able to download their WBJEE Hall Ticket after issued by the board. It will be available to candidates through online process. The admit card must be kept safely till the end of admission procedure as it contains very crucial information. Here we have mentioned the procedure to download the admit card, exam date, important instructions etc. Candidates can check the West Bengal JEE Exam date here along with the other important dates. We will update it after the release of official dates. Go to the “Download WBJEE-2019 Admit Card” link and click over it. Enter the application no, password, security pin and then click on “Submit” button. The admit card in pdf format will be shown on the screen. Download it and cross verify all the details printed on the generated admit card. Take the printout of the downloaded hall Ticket. No duplicate copy of Hall Ticket will be generated if you lost your admit card after exam. You can get duplicate admit card till the date of examination. In case any discrepancies, aspirants can contact immediately to the official authority of WBJEEB. Candidates are advised to download the admit card before the exam date to avoid the last minutes rush. Students need to carry any one of photo identity proof (Voter ID/ School-ID/ Driving License/ Aadhaar card/ PAN card/ Passport/ 10th or 12th Admit card) along with the WBJEE Admit Card. Make sure that your admit card is not tampered with or damaged. Candidates will not be allowed to appear in the examination with mutilated or soiled admit card. Candidates must reach the exam center 30 minutes before the exam timing. In order to get duplicate admit card, request to the board with the demand draft of Rs.500/- in favor of “WBJEEB” payable at Kolkata. You can also take help of Previous Year Papers to ace the exam. It will help to boost up your confidence so that you can perform well in the exam. We hope that the information provided above will be helpful for you. Leave your query in the below comment box.